Members of the Bahamas Developers Association met with the Hon. K. Peter Turnquest, Deputy Prime Minister & Minister of Finance to discuss concerns impeding major developments. Although industry principals welcomed his assurances, they await specifics of implementation and timelines. 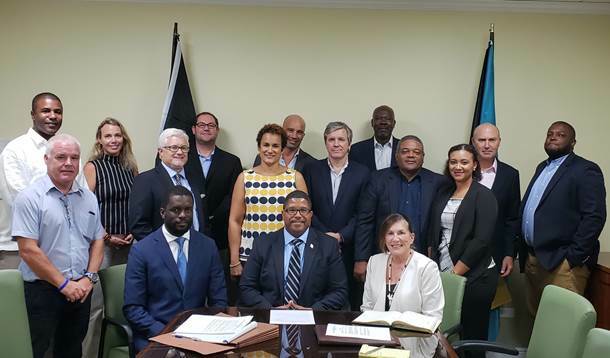 With more than $1 billion in real estate development pending from Abaco to Exuma and concerns about recent changes in tax policy, the newly-formed Bahamas Developers Association met this week with Deputy Prime Minister and Minister of Finance Peter Turnquest. While the meeting with developers was not until late September, the DPM had acknowledged concerns and maintained contact throughout the summer, a fact that the association said provided temporary comfort, but it was not until the face-to-face with representatives of some of the largest projects in the country took place that developers breathed a collective sigh of relief. Among those in attendance were representatives or principals of Albany, Arawak Homes, Sterling Hurricane Hole and Sterling Global Developments, Aristo (ONE Cable Beach, Balmoral and THIRTY SIX), Palm Cay, Baker’s Bay, Passerine at Abaco Holdings, Starfish Construction, Children’s Bay Cay and Williams Cay, Exuma, two attorneys and a real estate accounting specialist. Christine Wallace-Whitfield, President of the Bahamas Real Estate Association, and Heather Peterson, a member of the BREA board, also participated. Together, their existing projects totaled well over $1 billion and for some, the value of development was in the multi-billions. “My technical team and I stand by to assist and you will be pleased to know that we are making changes in the DIR (Department of Inland Revenue) to expedite and facilitate payment of the VAT credits which you are due,” the DPM assured industry reps. The wording of the July 1 budget denied the right of builders and developers to include the cost of construction on VAT returns. That, along with long delays in VAT credits that some were experiencing, including one Bahamian condo developer who was owed millions, had thrown the industry into a tailspin and prompted the creation of an association to represent what had been individual and competitive entities. The group met several times over the summer. The positive meeting cleared the way for Palm Cay, which had put its $100 million One Marina project on hold pending resolution of the VAT implications. A date for that groundbreaking is expected to be announced shortly. And a Bahamian developer who has held off on a high end mixed-use project on 12 acres said the resolution of VAT-related matters on development “revived enthusiasm” about those plans. That project, he said, would create several hundred construction jobs and be a boost to the economy for several years. Developers, attorneys and real estate professionals offered to assist government going forward to make information available at the time of transaction closings about Real Property Tax obligations.